Kiawah Island, South Carolina, is home to many different birds, deer, alligators, bobcats, sea turtles, and dolphins. Out of all those creatures, one of the most beloved and charismatic animals is the Atlantic Bottlenose Dolphin. Bottlenose dolphins are extremely social creatures and are sophisticated enough to communicate with each other. They travel in groups, called “pods,” that consists of 10 to 15 dolphins. Often, pods assist mother dolphins in raising their calves. Dolphins communicate with each other by squeaking, whistling, leaping out of the water, snapping their jaws together, and butting heads. They also work together to get food. One of the most interesting facts about bottlenose dolphins is how they feed. The practice, called strand feeding, involves multiple dolphins herding shrimp or fish together. Then, the dolphins form a line and create a wave that forces their prey onto the shore. 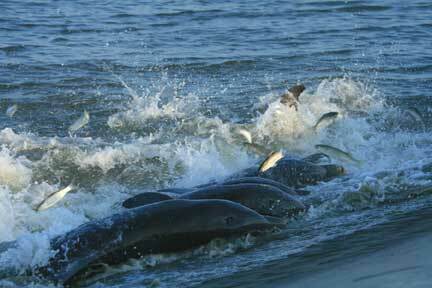 Lastly, the dolphins launch their bodies out of the water to feed. This unique process only occurs along the coast of South Carolina and Georgia. If you are lucky enough to witness a strand feeding, it is very important to remain back from the scene and never intervene. Like their name suggests, bottlenose dolphins have a very short and stubby beak. They measure anywhere from 6 to 12 feet and can weigh up to 650 pounds, fully grown. Their smooth skin is very sensitive and regenerates every few hours. They are a mostly a gray shade, but their bellies have a hint of pink. Due to the slight upturn to the corners of their mouths, they always look like they are smiling. Bottlenose dolphins have a thick layer of blubber, which helps them maintain their body heat and protects them from predators like sharks or killer whales. Dolphins never fully sleep because, unlike humans, they must be awake to breathe. While bottlenose dolphins cannot smell, they have extremely good hearing and eyesight. You can determine the age of a dolphin by counting each layer of their teeth. They can swim over 20 MPH and dive as deep as 800 feet below the surface. Some bottlenose dolphins remain in the same region for generations, never migrating. 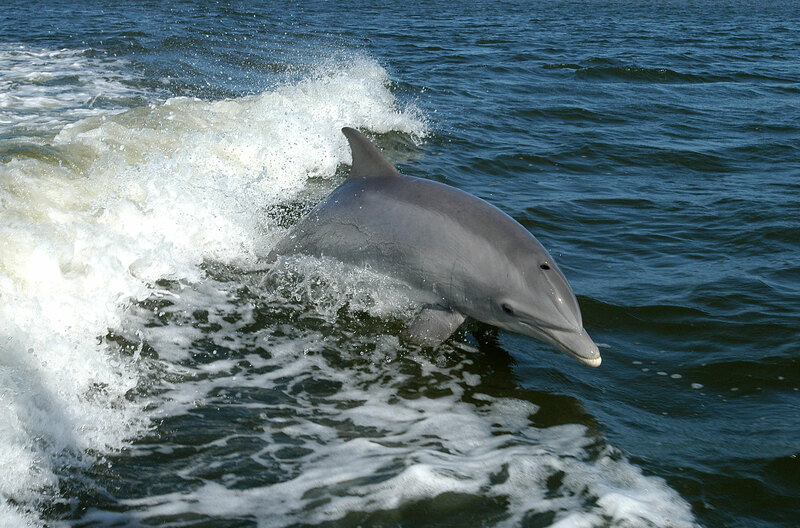 If you are interested in the opportunity to see a bottlenose dolphin, we would love to host your stay! Bring the kids for a family vacation or go on a romantic vacation for two. Either way, take a look at our rental properties online and book your Kiawah Island getaway today!